Synopsis: Telling the true story of a group of journalists working for the Boston Globe newspaper who uncover the horrific details of child molestation at the hands of Catholic priests and the subsequent attempts to hush everything up. Review: Every so often in the world of news and current affairs, along comes a story that is so shocking and galling for a number of reasons, it would cause you to read your newspaper, watch your television, or listen to the radio with just disbelief and horror that such an event came to pass. Many stories revealing such wickedness often slip under the radar, and do not see the light of day, and that may have been the case for the subject of this powerful drama of the scandal that rocked not only the Catholic Church, but the entire world to its core. It may well have not reached the public’s attention, if it wasn’t for the grit and graft of some brave journalists. The screenplay, penned by McCarthy and Josh Singer, which was on the 2013 Black List of unproduced screenplays pulls no punches whatsoever. The story is gripping, and disturbing at the same time. When nudged by an incoming new editor in the direction of the scandal, the team of journalists quickly begin to find something deeply disturbing, and as the film goes on, interview after interview, the full extent of the scandal emerges on the team and the full realisation of the crimes that have been committed come into view. The dialogue scene to scene keeps the attention of the viewer transfixed on the screen. With each conversation, whether with a lawyer, some victims, some people within the church, or whoever it may be, the team show great tenacity to dig deeper and deeper scratching every surface they can until there’s a story for them to run. It’s a dialogue driven film, but when it’s written this well, it’s riveting to watch. The ensemble cast each deliver truly excellent performances, but it’s the performances of the Spotlight team in particular that shine the brightest. After his Oscar nominated turn as a washed up superhero in Birdman, Michael Keaton delivers another excellent performance as the editor of the team that comprises of Rachel McAdams’s Sacha Pfeiffer, Mark Ruffalo’s Michael Rezendes and Brian D’Arcy James’s Matt Carroll with John Slattery’s Ben Bradlee Jr. and Liev Schreiber’s newly appointed editor Marty Baron keeping a watchful eye over things. All excel but the standout performances are that of Mark Ruffalo and Rachel McAdams, who have both gained well earned Oscar nominations for the Best Supporting Actor and Actress respectively. Ruffalo in particular has an almost Hulk-esque moment at one point when the full depravity of the scandal comes becomes very crystal clear. With such a delicate and controversial subject matter, approaching this film cannot have been easy for McCarthy and Singer, yet it is handled tremendously well. The direction is subtle but it emphasises is firmly on the need for justice for the victims. The reporters are not patting themselves on the back and having a drink celebrating at such a big scoop, instead they’re just aghast at what they have observed during their investigation. It is uncompromisingly brutal when the penny drops and there is a need and a desire to print their story and bring the perpetrators to full justice. In this day and age when the internet is taking over the journalism and publishing industry, it just goes to show that through real grit, determination and hard work, shocking truths such as these, can be brought to the attention of the public, and full credit to the brave journalists who did so. 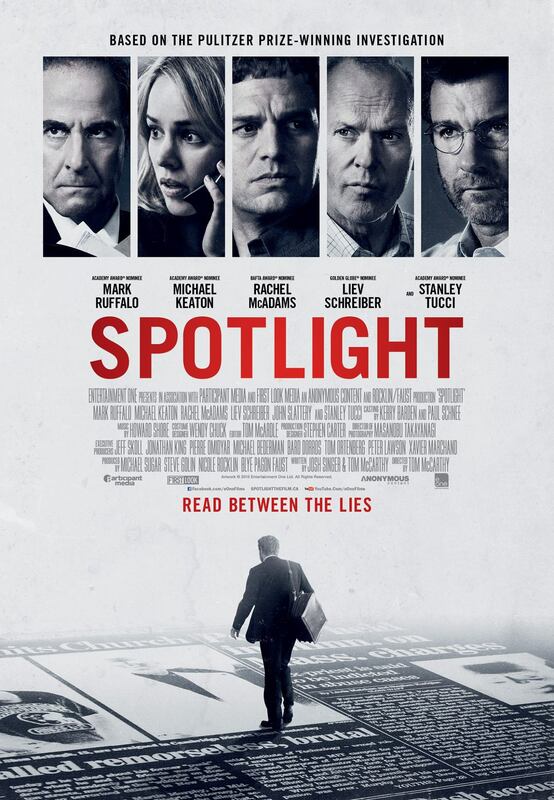 Uncompromisingly brutal when it comes to the subject matter, with terrific performances and excellent well written dialogue, Spotlight will shake you to your core. I’m going to see this movie in the coming week and your review has made me want to see it even more. It’s my favourite for Best Picture at the Oscars Vinnieh, it will take your breath away! I have heard nothing but excellent reports about this movie. I’m looking forward to seeing it.